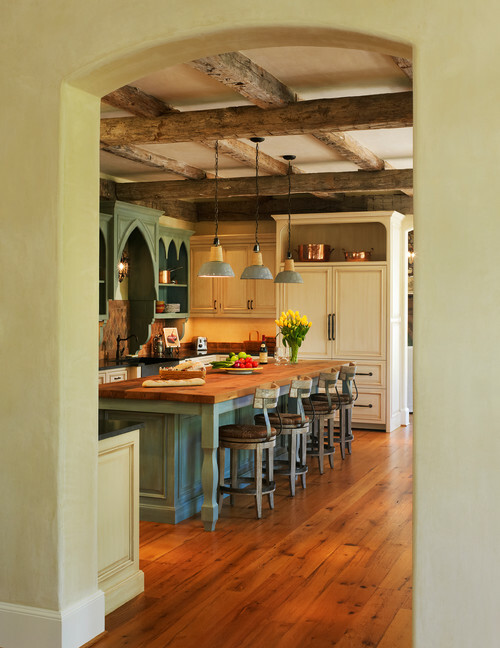 This charming home may be fairly new and big, but it was designed to have the warmth and patina of an old French country cottage. 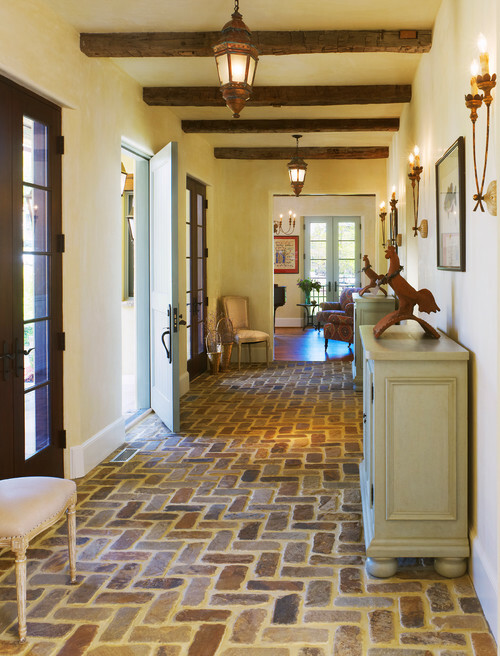 I love the details that Barnes Vanze Architects put into it, from brick floors to beamed ceilings. It was built for a family in Washington, D.C.’s new Phillips Park, a development planned by Barnes Vanze. Their clients wanted a home that reminded them of the French countryside, and they used photographs of cottages from Normandy to Dordogne as their inspiration. Now their new home reflects that. 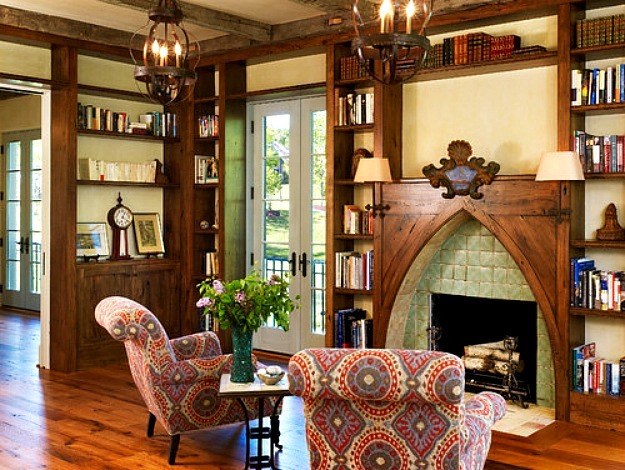 Love the fireplace and built-in bookshelves in the living room. 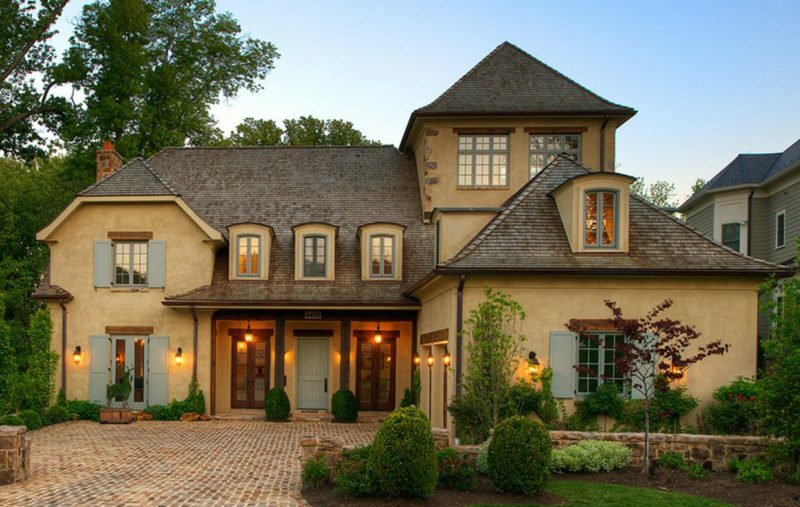 The soft country palette and picturesque massing of this new country French cottage speak of “home.” The clipped gables, engaged dormer and belvedere stair tower connect with their inspirational rural examples in France from Normandy to the Dordogne. 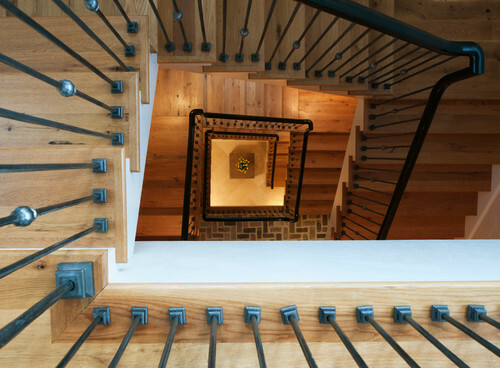 The use of natural materials, craft, details and scale enrich the experience. Reclaimed wood, tiles, stone, natural stucco and interior plaster offer patina and familiarity, while wrought-iron details and handmade tile add fine-scaled detail. The entry court welcomes guests but maintains privacy, while the terraces and cascading stairs connect the rear with its National Park views. Several strong elements anchor the family experiences in the home through the kitchen bay window; library and family room fireplaces; and upper-floor dormers. The gentle palette of natural materials runs seamlessly into the interior and out to the rear terraces, again reinforcing the connection to the landscape. Principal Designer on the project was Anthony “Ankie” Barnes. Visit the Barnes Vanze website for more information about their work. Photos by Anice Hoachlander of Hoachlander Davis Photography. Well done! I’ll take it, furniture and all! Bet there’s even a car in the garage that I could get used to… Nice understated interior details, love the soft corners. OK, Rich – if you take the house, can I at least drive the car? I’m with you – furniture and all! I use the Houzz app on my iPad! Absolutely LOVE it. Totally my taste. And having a large house with a cozy cottage feel was exactly my plan for our house, too! It can be done! Thanks for sharing! damn I love those brick floors! 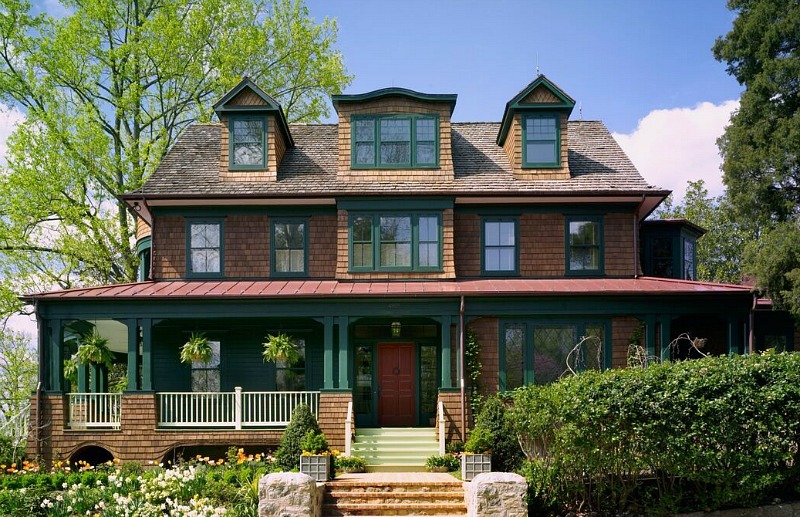 They did a dynamite job – the house is gorgeous AND cozy! Lovely…really big, but still charming. Not crazy about the crest over the fireplace,the empty spot behind it seemed like maybe a space for a flat screen tv ,but kind of odd. Other than that, the colors, the brick floors, the ceilings…everything was gorgeous! So many good ideas. That fireplace is to die for. The only thing I would change is the wide grout lines in the brick floor entry…A bit closer together, please. Little more upkeep than i’d like. If you lived here, someone else would take care of the upkeep. Love this house! I love the fireplace – and how nice that they didn’t ruin it with a TV, although that bare spot DOES call out for something??? 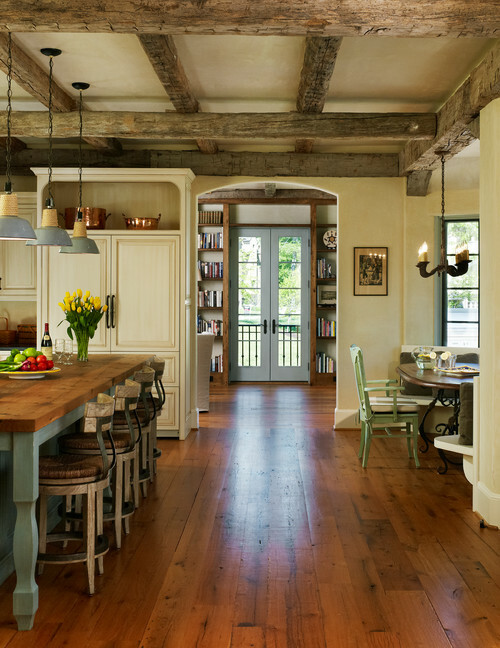 The kitchen is unbelievably beautiful… AND I love the choice of light fixtures. Just great details throughout! GORGEOUS!! I LOVE IT ALL! Oooooh my!!! I love this home! Absolutely stunning! Swoon! I’m normally an old(er) house nut but this is gorgeous. Only nitpick I have is the kitchen island looks a tad too heavy for my aesthetics, it weights the room too much. Something lighter, more akin to the kitchen in the Practical Magic house would meld better. Where is this beautiful house? You made an interesting point about the kitchen. I actually had to go back and look at Julia’s Practical Magic post, to see the island again. Is the one in the movie really smaller and less bulky than this one? I’m not sure. I do know that they are both gorgeous kitchens. French Country is a love of mine, so this just made my day! This is so beautiful! Usually I don’t like big new houses made to look vintage/charming, but the architect really did this right. Gorgeous! My favorite style! Not so fond of the arched fireplace, but I like everything else. This house is beautiful! I would take it just as it is. Wouldn’t change a thing! That is very, very nice. I don’t like big houses or new houses normally, but they really did a nice job of capturing the feeling of an old French house. I love the gothic arch and tile on the fireplace but not the crest too much. Hope a tv doesn’t go in the empty space. A gorgeous oil painting would be much better (maybe with the tv behind it). Love the lighting, especially the lack of recessed lights – it makes all the difference in the character and feeling. It’s not exactly my taste but I can’t fault any of the design – a wonderful job. I want to know where this house is too! Lovely blog, I haven’t been here before. I was lucky enough to work on this project and its one of my favorites. Great mix of reclaimed, old, and new. …Now, I’m going back to check out some of your other posts! I’m with others who said the architect managed to create warmth and intimacy in a large space. The baseboards and other rich touches are beautiful. What a lovely home. I am SO over teal, though. Please, some warm country French colors, mustard gold, soft pinks and violets, Mediterranean blues…..and some fabrics on the windows, if only a valance. 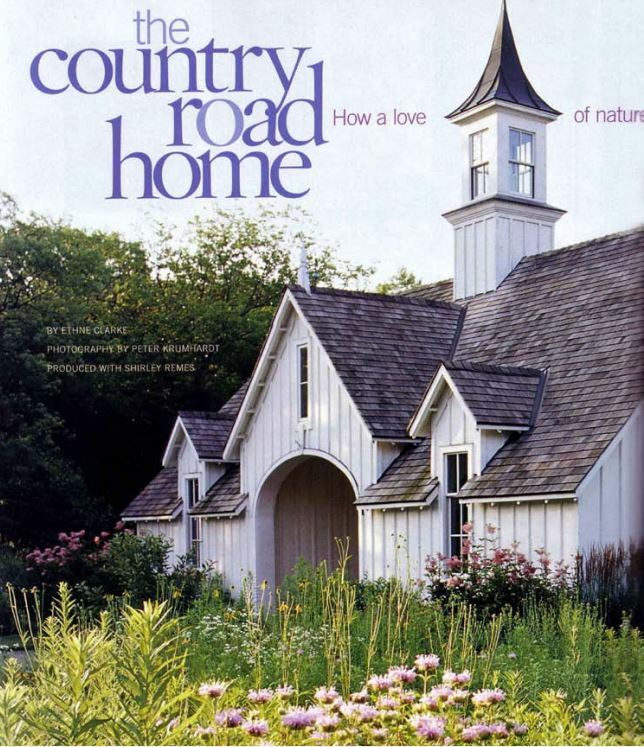 I would love to see what designer Charles Faudree would have done with this beautiful home. Absolutely beautiful! I want it now! Gorgeous! I love the blue green cabinets in the kitchen – yes, I saw them on Houzz, too. And I really like the small arched tile fireplace with the built-ins around it. The tile picks up the kitchen color – is this room off the kitchen? There is room on the mantel shelf for simple accessories on either side or a painting in the center – but I do love that cartouche. 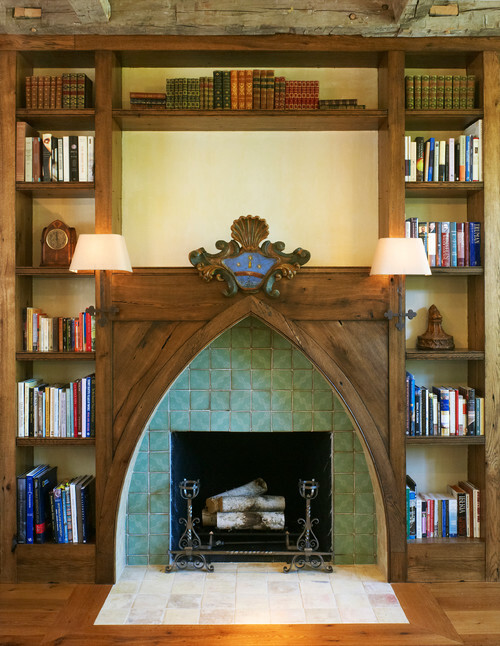 The stone fireplace in the great room and all the reclaimed beams are gorgeous too. I’d take it just like it is. Gorgeous home! I love the rustic wood beams on each ceiling and I must say, each room was well done. Beautiful home, but I can never understand why a big house like this is so close to its neighbor. What happened to set-backs and such? Doesn’t anyone want a big yard anymore? This is truly wonderful! The house is so true to it’s character. I love that! So often I see such a hodge pods of periods and styles in new construction. Builder’s take note and learn about architecture. Might just help you sell more houses! 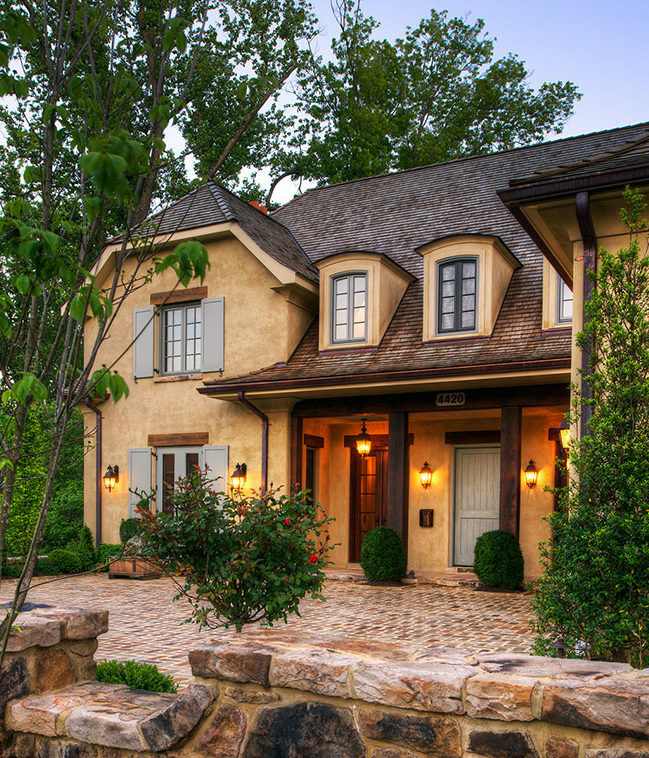 Thanks for showing us this charming home. Do you know what they finished/sealed them with? Wow, they really got this right! Just stunning. Packing my bags as I type! Movin’ IN! pre-20th century inspiration in new kitchen construction. Although, I think I would have gone with a big old french harvest table and chairs instead of the island that looks too big and heavy for the space. As being the lead trim carpenter, it was the most fun and challenging project I have done in years. Thank you Mary Stewart and Gibson Builders. Special thanks to the architect, Barnes Vanze, for such a challenging project. Is that all you got mate?